Walking groups are forming everywhere. They are fairly easy to find on google. Most likely there are some in your area. People want to connect and that connection makes walking more enjoyable. It also makes the time go by quicker. 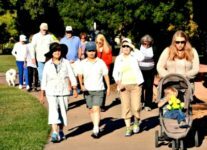 Below is an article on how to start a walking group. In fact, it’s how World Walk To Wellness started their group that has been walking every week for over 8 years and is open to anyone who would like to join. START SMALL – Invite a few friends, family members, clients and/or colleagues to join you in exploring nearby places to walk (public parks, trails, even shopping malls in inclement weather). SPREAD THE WORD – Use e-mail, social media, or existing newsletters to let others know of the weekly (or monthly) walking opportunities. Taking sign-ups at a health fair or convention booth also works. FIND A SPONSOR – It may be you and/or another individual, group, or company related to wellness. The sponsor can provide funding for communicating via an established channel, such as Constant Contact which is less apt to end up in a spam filter. COMMUNICATE REGULARLY – Send out e-mails listing the destination of the next walk. Consider incorporating photos from the previous walk. You may also want to include links to other walking groups or to sponsor information. CONSIDER RECRUITING ‘WALK STARS’ – These are volunteer guest leaders who can take your group to new places (or fill in when the originator is unavailable). PLAN FOR VARIOUS FITNESS LEVELS – Your group may include some “turtles” – those who walk slowly or avoid hills – as well as some “hares” – those who seek greater challenges and longer walks. Plan destinations that attract both walk levels. The faster group may want to start an hour ahead of meeting up with the slower group on laps around a local park, for example. TOGETHERNESS – Try to make sure that no one ends up walking alone. The idea is to “Walk ‘n’ Talk” together – which makes an hour’s walk fly by quickly, with seemingly little effort. LET US KNOW! Send an e-mail to Walks@WorldWalkToWellness.org to share your story. We are eager to celebrate your success!